My Pieces of Time: Color Combos Galore!!! Okay, I've seen so many projects done for CCG, but I've never had time to join in. I finally participated in a challenge! The palette was attractive to me, I love purple and lavendar!!! These are more wedding pics for dd's wedding album. This page was also based on a sketch by Beggahuna for Swirlydoos!!! I added lots of pearl accents, that was part of the inspiration challenge. I added little blue and white pearls all over. I made a little pearl stick pin too. I added a chipboard title done with white alphas, with crystal stickles added to the top. This is a close-up of the little blue pearl dots that I put on the lace border. 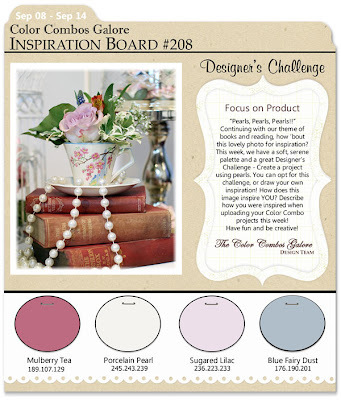 And this is the color palette and inspiration board. I will say, for my first time, I really enjoyed this challenge, and I was made to feel very welcome at CCG. I look forward to doing more of their challenges!!! Thanks for visiting my blog! I appreciate it! Goodness Patti, this is absolutely gorgeous!! Love the colors and the fab design!! Patti, this is fabulous, I love what you did with the sketch. beautiful layout, love the colors ! My oh my did I love this when I set eyes on it in the gallery! It is indeed such a beauty - the design is indeed fabulous!